I envisioned myself passing two years in the heart of a South American jungle. When I received my invitation to Guatemala in Central America, I started my research. Since Guatemala is mountainous, a third of the country is high elevation. How do I get myself into the hot lowland jungle? There’s a two in three chance, right? Here’s the map. I know that the whole north panhandle region is the expansive Petén forest. I can assume that both coasts are low. The Pacific side is volcanic slope, probably extremely fertile. The north coast is on the Caribbean so it’s likely biodiverse, with centuries of island-hopping migration. And according to the relief map, there’s a lowland valley that stretches from the Caribbean coast through Lake Izabal in the northeast and another region of low elevation between Quiché and Alta Verapaz. So in my mind, I formed a generalized map similar to this one, marking potential lowland forest where I’d like to serve (green). During the second day of staging in Washington D.C., the day before we flew out, I discovered that there are areas in Guatemala where Peace Corps doesn’t go. Drug smugglers heading north from South America often transfer from sea or air to overland routes in Guatemala. Both coasts are obvious import/export hotspots. Both coasts are off limits. Since the Petén contains a lot of dense and unexplored forest, it’s a good place for smuggling routes and clandestine airstrips. 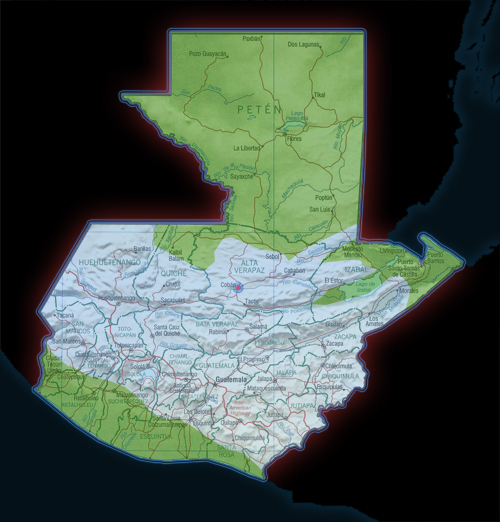 The entire Petén region is closed to volunteer service. Oh, also, no volunteers around Lake Izabal due to crime. My mental map was a mess. If Petén’s not available, what’s left? There’s a little bit of jungle south of Petén, and between Alta Verapaz and El Quiché. So I decided my best bet was Laguna Lachuá national park in Alta Verapaz. It’s hot and they have crocodiles. But my site is an assignment, not a choice. We trained for more than two months not knowing where in Guatemala we would be working. I worried out loud to Kate when I was visiting her site in Toto. The maturity of that perspective was sufficient to embarrass me. So even though I continued to dread a two-year stint in the Western Highlands fighting cold weather, I was more ready to accept whatever assignment I received. In the end, I didn’t get Lachuá, it went to my friend Ted. Instead, Peace Corps threw a curve ball, assigning me to two neighboring sites west and northwest of Cobán, Alta Verapaz (center). That puts me outside of my imaginary boundary, at an elevation of about 1,300 meters. I will be working for Samac and Sanimtaca, two indigenous agricultural cooperatives in the region. I met with representatives from both communities at Peace Corps headquarters in Santa Lucía. We talked about the work ahead of us and I was satisfied that everyone at the table was looking forward to getting started. As they described their aldeas, I took them over to the huge relief map to point out where they are. After I found Cobán, I traced my finger west and north and stopped when I found a mistake in the map. There was a deep cavity where Sanimtaca was supposed to be. It looked like someone stuck a finger into the map before it was dry. I showed my new friends, but they didn’t look surprised at all.